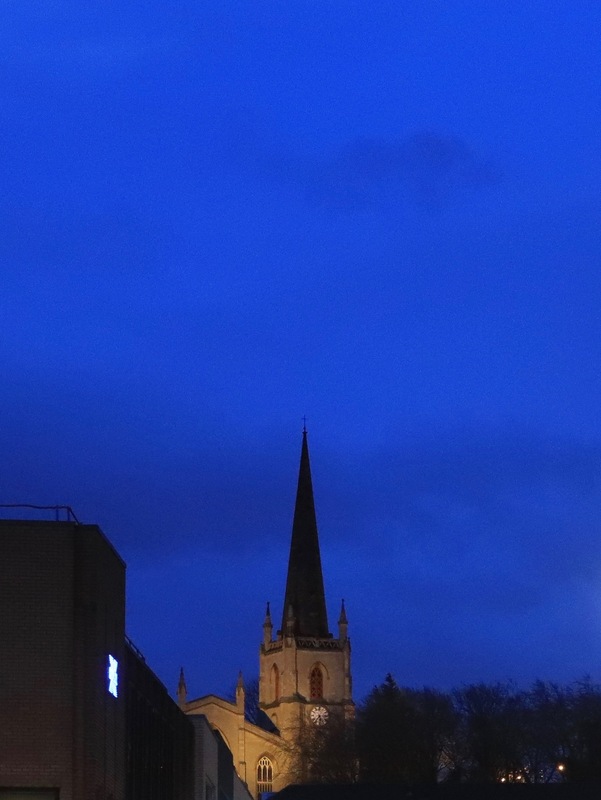 November 28th – Telford, that evening, viewed from the Euston Way. 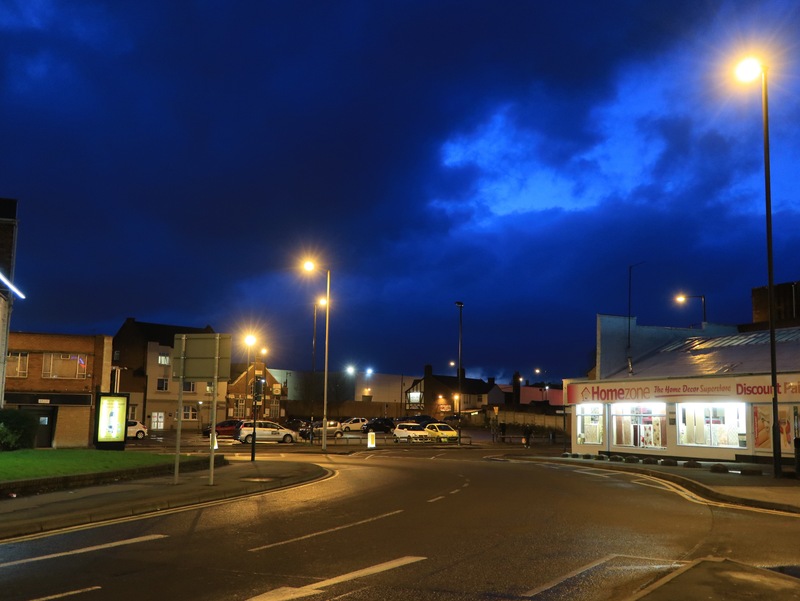 Telford looks best at night. The station is crowded due to a cancelled train. The train I’m expecting is late. This is not going to be fun. The lights, the steel and glass, the pretentions to being internationalist, commercial, vital and a centre for financial business work best at night. In reality, Telford is an industrial and commercial sprawl, but it ain’t all that. But it could have been a contender. October 30th – A shoutout here for a little shop in Darlaston I love – Mindful Gifts. It’s a charity shop, but not as we know it Jim: It’s a veritable treasure trove of music, books, ephemera and great miscellany at really low prices. Mindful Gifts is run in aid of folk with dementia and it a really wonderful charity -and there’s always a buzz around the shop. Find out more here. Do pay a visit if you’re in Darlaston. February 21st – Looking down Victoria Road from Darlaston Town Centre you’d never really think you were in the industrial Black Country. Although one can hear distant industry and traffic, this sleepy, architecturally fascinating byway remains a little place of calm and historic beauty. Just on the right, past the pub, the Town Hall, opposite the four square Post Office and Rectory Avenue. Beyond those, Victoria Park. Even on busy days, this is a sedate place to wander into the town. December 5th – I wanted to take some night shots of Aldridge, which felt quite Christmassy), but realised my tripod was at home. Out of 20 or so handheld shots, this was the only one to be anything close to usable, and this only just. But it does convey the atmosphere. February 9th – Meanwhile, other signs of life – primroses in a town centre planter, just being bright and trying to get our attention. Gorgeous little flowers, a little dishevelled by the elements, but colourful and cute, all the same. August 20th – I had to pop into Walsall for some bits and pieces on my way home, and so I rode up Church Hill and down the marketplace. Walsall may have changed beyond recognition in many ways, but that view of the yellow sandstone church at the top of the steps is gorgeous, iconic and unique. August 16th – This young grey heron was fishing in the canal, just by the old marketplace on Silver Street in Brownhills. You know, right by Tesco. On a Saturday afternoon. I’ll let that sink in a bit. I’d never have believed we’d see this kind of thing in Brownhills when I was a lad. Hello, heron – I wish you an excellent day’s fishing. 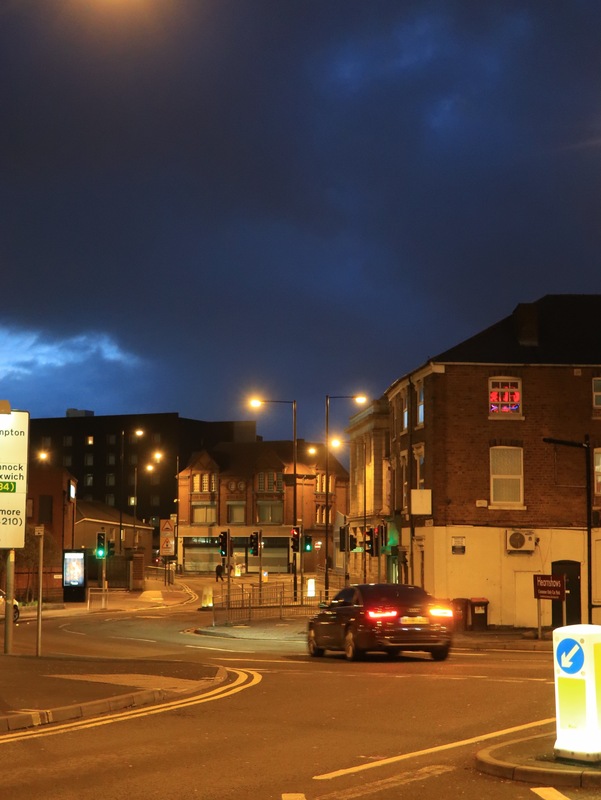 March 28th – Walsall’s second Night Market was great, I really enjoyed it. I didn’t expect these to be anywhere near as good as they are, as on the face of it the idea seems a bit daft. 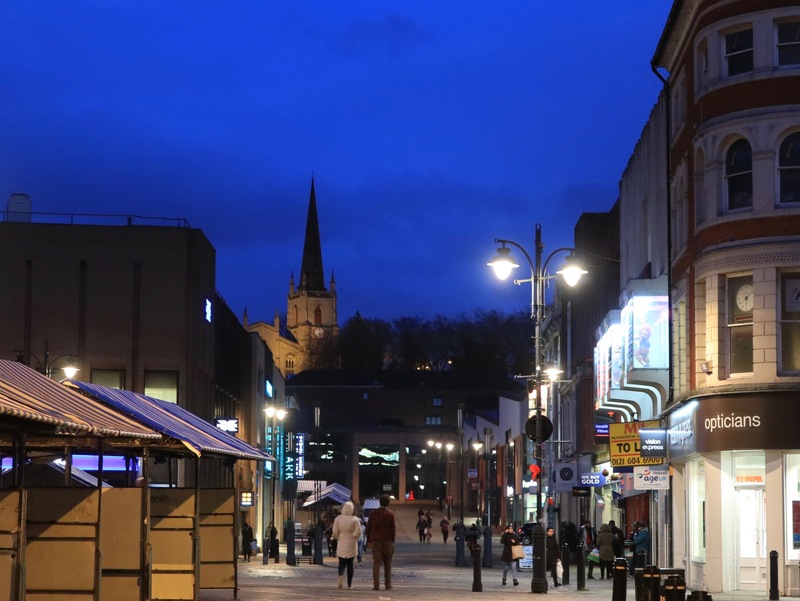 They succeed due to an eclectic range of traders and an almost festival-like atmosphere, which is most unusual for Walsall. Well done to all involved. Despite the biting cold, there was a fine turnout. My only reservation is the same as last time; why not incorporate this into a late shopping evening? Again, almost all the local shops were shut, which seems like such a wasted opportunity. It’s like the market is happening outwit the normal retail boundary of the town, rather than enhancing it. This was worth the tortuous journey, and I look forward to future events. July 14th – A grey afternoon in Walsall. I realised at 1:30 that I had a package to collect from the central Post Office in Walsall. Taking a chance, I decided to make a dash for it. Grabbing the bike, I left at 1:35 (the office shuts at 2pm) – I was locking my bike up outside the sorting office a 1:50pm. That’s why I ride a bike. 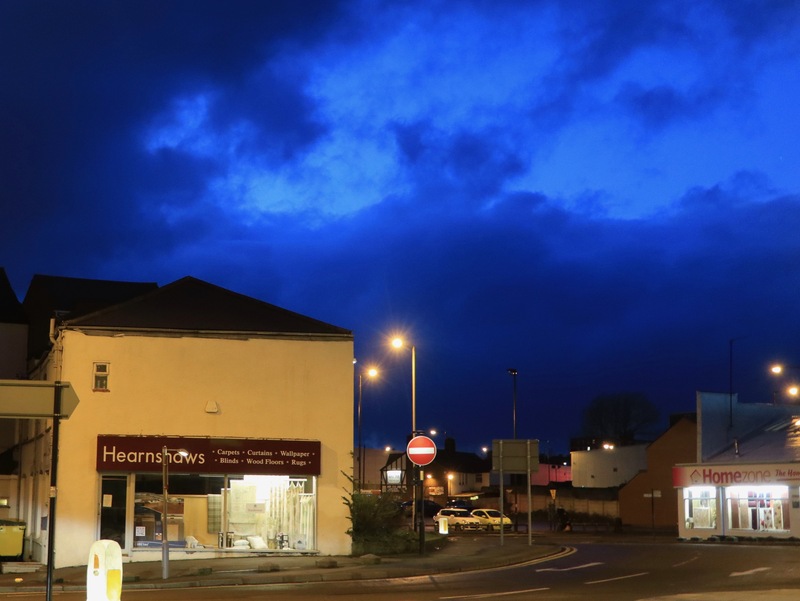 I took mediocre tea in Costas, then explored the backstreets for a while, before heading through Caldmore, to pick up indian snacks for the week ahead at my favourite sweet centre, Harguns. On the way, I noted that the old Guildhall Mews, in Goodall Street, was quietly decaying. I remember when this was open as little shops, and you ould walk right in, around 1990. There was a CD audio specialist at the back called CDX. I don’t know how long it’s been shut, but the plant life is having a ball. The BOAK building is still cowering, trying to look inconspicuous to the municipal arsonists, who recently torched another derelict building nearby. It’s a handsome place, and something really should be done with it. My eye was also caught by the White Hart, on Caldmore Green; one of the oldest buildings in Walsall I believe, and a shining example of what can be done to preserve heritage. Still can’t warm to the building though, knowing they found a petrified severed arm in the chimney. Ugh. It’s in Walsall Museum, and dubbed ‘The Hand of Glory’.